The DOQ Priorat is formed by 12 grape growing zones, the different villages. To establish the zones in the wine sector, geographical, environmental, climatic, social, historical and economic variables have been taken into account. 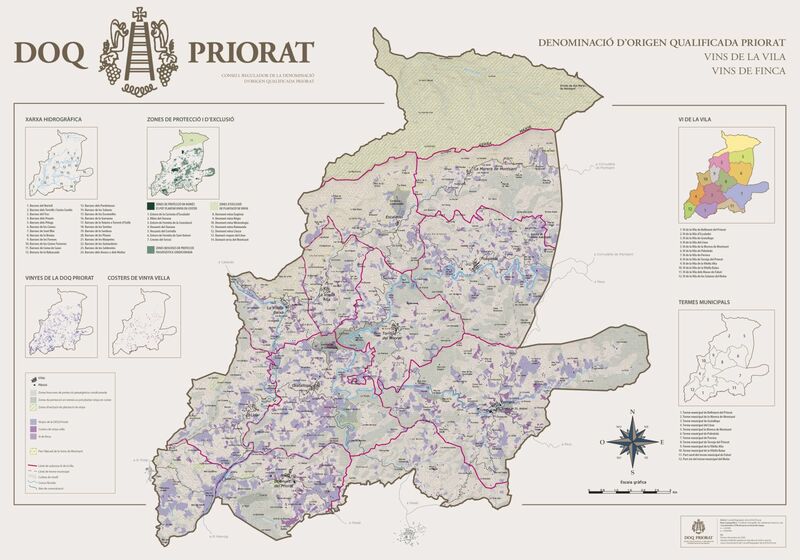 Using this information, the social root of the wine with the cultural roots of each town is set and is identified with each of the social realities of the subzones of the DOQ Priorat, which go beyond the existing administrative boundaries. The towns that make up the DOQ Priorat are Bellmunt del Priorat, Gratallops, el Lloar, la Morera de Montsant, Porrera, Poboleda, Scala Dei, Torroja del Priorat, la Vilella Alta and la Vilella Baixa, and the grape growing zones of Masos de Falset and Solanes del Molar. Village Wines (Vins de Vila), those that have been made from grapes of the same town, are an expression of the bond of these wines with the territory. At the beginning of 2013, more than twenty wines were registered as Village Wines, a good example of the commitment to quality and authenticity of the wineries of the DOQ Priorat. The aim of this project is to take a step forward in strengthening the identity of the towns of this denomination of origin, reaffirming further their ties with the wines that are produced. In fact, one of the characteristics of the wines of Priorat most valued by experts is their high fidelity to the land of origin, that is to say, to the soil (in French, terroir). The local ways of life give identity to the area, and the Consell Regulador of the DOQ Priorat, preserving them, also supports their progress and improvement. For this reason, the DOQ Priorat (in accordance with city councils and local agents) has announced the organisation of different shows, tastings and local fairs dedicated to promoting the wines of each of the towns in this wine region. The Consell Regulador of the DOQ Priorat, the local councils and wineries want to go one step further and have agreed to offer a wide range of popular activities throughout the year with the intention of bringing the wines closer to the public.